Anyone in writing knows that book publishing these days demands far more of authors than it did in days of yore. This week, Publisher’s Weekly ran an article detailing the intensity with which one particular author is engaging in this marketing battle. 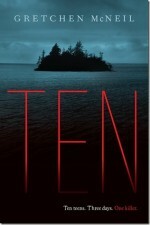 When Gretchen McNeil found out that Barnes & Noble would not be carrying her book, TEN, when it launches in a few weeks time, she took matters into her own hands. Using her online presence (blog & Twitter) she recruited an army of volunteers, who could rise in the ranks by performing successively more difficult grass-roots marketing tasks. So hats-off to Gretchen McNeil, who has taken guerilla marketing to a whole new level… that of recruiting an entire army! Congratulations on a war well run and best of luck on September 18th! This entry was posted in Interesting People, Media, Writing. Bookmark the permalink. I’m so impressed with the lengths authors will go to…I just wonder where and how they find the time. I agree! Sometimes, with all the other work we have to do, it can be hard to find the time to actually WRITE!